This is a new cutting edge unisex therapy copper bracelet that 4 wonderful things going for it, so we call it 4 in 1. 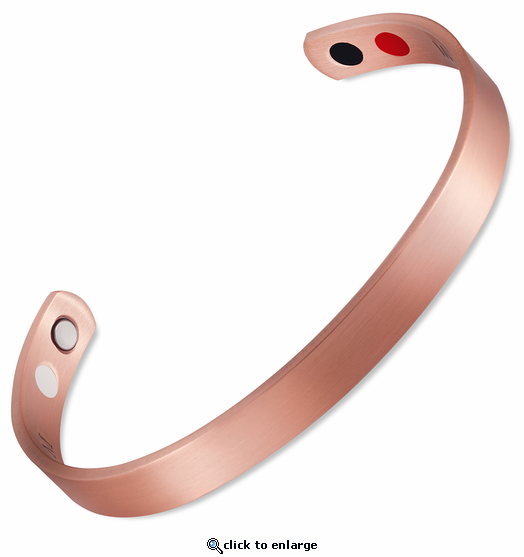 This solid copper magnetic bracelet has 1) a 3000 gauss bio north facing magnet(silver), 2) Germanium(Black), 3) , Far Infrared Ray technology(Red), and 4) Negative Ion technology(white). It also has a stainless steel magnet cap for added durability. We hope you will enjoy this wonderful bracelet that combines 4 technologies that are believed by many to help our bodies naturally in many different ways. The information below is designed for educational purposes only and is not intended to be a substitute for informed medical advice or care. We make no overt or implied claims for effectiveness, health, cure, treatment, or mitigation of any condition. Far Infrared Ray is believed by many to help the body detoxify and maintain vitality. Negative Ions are believed to promote better metabolism and balance in the body. It is believed that they may improve the body's functioning in many ways including the immune, cardiovascular, muscular, and circulatory systems. Germanium is believed to help in many ways including the immune and circulatory systems. Many believe it may also help with fatigue, improving sleep, detoxify the body, and pain conditions. Neodymium magnets are believed by many to help in many ways including circulation and reducing inflammation and pain conditions. I had one just like it however, I gave it away. I couldn\\\'t believe how much I needed it. When I put it on, my balance was regained. I got a sense of well being I hadn\\\'t had in weeks. No more joint pain, I feel young again. Won\\\'t give this one up. Contact was great and very beneficial. All questions answered to my satisfaction. Rapid delivery and very good quality. I am very happy and so is the recipient- my hubby! Fits nice and after a few days of wearing it my hands have stopped going to sleep at night. I don't have to wear the wrist braces to bed on both hands anymore. What a relief. Thank you!!! The bracelet fit perfectly, I received it in a timely fashion and easy to adjust to the wrist. I would recommend this company. Perfect fit, fast service I will order again from this company. I haven't use yet, it seems good. I really, really like this bracelet! It was working for me within 5 min. I can wear it all day when I'm working outside. It seems to modify my wrist pain to a very tolerable level. I would definitely recommend. I accidentally smacked the back of my hand against the corner of a wall in my home. The pain was so bad that I had x-rays taken to rule out broken bones. No breaks, but bruised bones are quite painful and take even longer to heal. The Dr. sent me home with a carpal tunnel wrist brace, which did next to nothing to relieve the pain and, in fact, made it worse over time. A friend mentioned that she had success in relieving her arthritic hand pain with copper and magnetic bracelets. In desperation, I ordered this 4 in 1 bracelet. Delivery was fast, and I was pleased that it was so substantial a piece. Quite pretty, if plain, and I get a lot of positive comments on it. Now, the more important and incredible thing of all, within a couple minutes of placing it on my wrist, the pain in my injured hand began to diminish, and was completely gone within half an hour! And within a few days, the pain in both feet, the beginnings of gout, disappeared as well. All from this single bracelet! Some might say this is only a placebo effect, but I disagree. I wear it day and night unless bathing, and the healing effects continues to this day. I am completely satisfied with my purchase and would recommend anyone to give this a try. Thank you MJS for such an extraordinary product! If the 4 in 1 is offered in different design styles, I will be purchasing some of those, as well. great product. wear it all the time.No pain when I wear it. It just goes away. They were both gifts. And they were very happy with them. I broke my wrist last spring and purchased this bracelet in anticipation of some stiffness and pain. As soon as the cast was removed I put the bracelet on and have not removed it since. Have had absolutely no pain with my wonky wrist. Great product!! Am looking to purchase the wider band. My grandpa always wore a copper bracelet and lived to be 99. I am sure he had aches and pains but never complained. I decided I needed to try this bracelet and I feel like my carpal tunnel and joint pain has decreased. This attractive and comfortable bracelet combines time-tested copper with 4 touted elements into one solidly crafted piece of jewelry. That was the exact item I searched the net to find, and it is even nicer than I had expected (especially at such a fantastically reasonable and saleable price point). I have worn it for two weeks and from the first day, my fingers no longer ached in the morning. My thumb and forefinger had been stiff and very painful for months, so getting such rapid results was impressive. Copper has been known to affect the body positively for many centuries and the other 4 elements' radiant energies wouldn't be receiving such a lot of attention if they, too, didn't have the ability to grant some greatly needed support to our stressed physical systems. I'll be back for more great products. Thanks, MJS. I thoroughly enjoy my bracelets! They are very beautiful and fit me well. The price was also very reasonable. Thanks very much! Don't know if it is working or not going to wear it no matter what. I was impressed with the weight of the new bracelet ( much heavier than any previously owned copper bracelets). I noticed a tingling sensation over my lower arm ( that had the bracelet on )when I was doing a brisk walk in the park, and that gave me assurance that the bracelet was doing it's job! My overall stiffness is less and am taking less Aspirin. Thanks for a great bracelet. I noticed that I was less stiff after wearing it only a day. I keep it on all the time except for bathing. I also appreciate the unisex sizing so that I received the correct fit. Love this bracelet a lot!! This was a great deal as well. I think I will buy another!